Take Narita Express Train from Narita Airport. 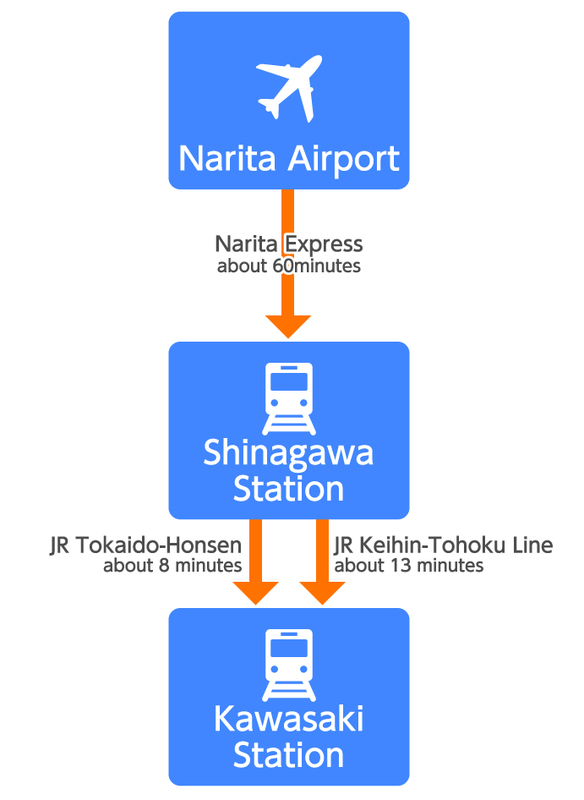 Any of Narita Express from Narita Airport is fine to take since they all stop at Shinagawa Station. This will take about 60minutes. Get off at Shinagawa Station. Take JR Keihin-Tohoku Line bound for Ohfuna, or JR Tokaido-Honsen bound for Atami or Odawara from Shinagawa Station. This will take about 13 minutes or 8 minutes. Get off at Kawasaki Station and your hotel is close by. Tickets: Buy a train ticket at Narita Airport Station from Narita Airport to Kawasaki Station. That will be 1660 yen. You also will need reserved seat for Narita Express train and that will be about 1500 yen (this depends on season). Please keep the ticket until you arrive at Kawasaki station. Reserved seat ticket is only needed for Narita Express train and not for the trains from Shinagawa.